Adele has only one goal: catch the purple-haired thief who broke into her home and stole her exocore, thus proving herself to her new police team. Little does she know, her thief is also the local baker. When her twin–a powerful witch and prime exocore material–disappears, Claire redoubles in her efforts to investigate. She keeps running into Adele, however, and whether or not she can save her sister might depend on their conflicted, unstable, but deepening relationship. The cast is wonderfully diverse with characters at the intersections of multiple marginalisations. No one shows this better than the titular character. Claire is genderfluid, sometimes feeling more comfortable as Claude. She splits her roles as baker and thief between her genders: by day, he is Claude the baker, by night, she is Claire, the Exocore Thief. While this works to protect her identity, it also works against her because her genderfluidity isn’t that neat. For example, there are days when Claude wishes he didn’t have to open up the bakery and could spend the time as Claire instead. In addition to being genderfluid, Claire is also fat. This seems like an unconventional choice for a superhero, but her fatness is never slows her down. Indeed, it is never a big deal in the story. Better still, her figure is shown as one still desirable to a more conventionally attractive character, which was something I very much appreciated. And it in turn led to some exploration of Claire’s aromantic identity. Pretty much the rest of the cast is likewise diverse in at least one way. Adele suffers from asthma. Her boss uses a prosthetic arm. Other members of their team are trans and one is an older, black, polyam woman. This diversity is supported by the worldbuilding: this is a society where it is normal to include one’s pronouns when introducing oneself and there are a variety of pronouns used throughout the story. It’s a society in which Claire’s reticence about her genderfluidity is rather unusual–a possible weak point of the story. It is portrayed as being the result of Claire’s own uncertainty about her identity, but it does seem a little out of keeping with the setting. Another thing I very much enjoyed about the story is that it features found family and family. Both Claire and Adele have good relationships with their sisters, each of which plays an important part in the story. The disappearance of Claire’s twin sister raises the stakes for her, lending urgency to her investigation of the exocores, while Adele’s investigation of Claire’s thefts leads the policewoman to develop a closer relationship with her own sister–an expert in the field of energy technology. This might be a superhero story, but it’s not a lone superhero story. A key theme is learning to rely on others. Both Claire and Adele start out on their own, each with a heavy burden to shoulder. At first, they try to do it on their own, but they slowly learn that there are times they need to ask for help and to recognise that there are communities around them waiting to support them. In Adele’s case, this is the new police unit she has been transferred to. In Claire’s case, it is the witchy community she has been out of touch with since her family fled the city. 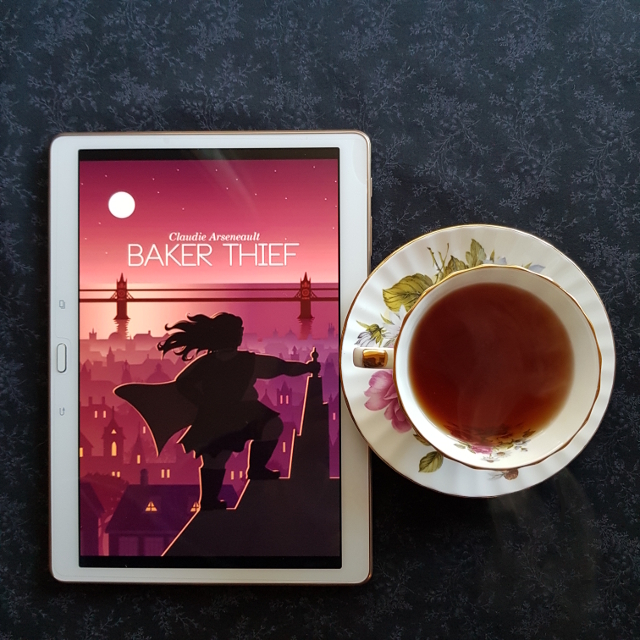 All in all, Baker Thief was a delightful book with a vibrant setting and a fantastic cast of characters. I’ve got my fingers crossed for more, since there is plenty of space for future stories to explore and I would love to hear more from Claire and Adele’s friends.